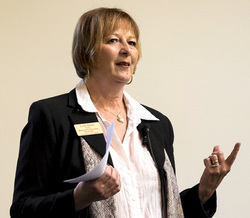 Whether you’re looking for a keynote presenter, a workshop leader or a webinar/tele-seminar facilitator, Linda has a number of popular topics to engage your audience. Contact Linda to discuss the possibilities for your group or organization. These are just some of the traits of highly sensitive people. You may have one or you may have all of them. Most people feel over stimulated from time to time, however highly sensitive people have to deal with over-stimulation on a daily basis. It’s a way of life. Family, friends and colleagues don’t understand what’s wrong with you. Most of the time you don’t understand what’s wrong with you. You may try to fit in and do what others do, but it all seems so overwhelming. In this program you will discover what it means to be highly sensitive. You’ll also learn tips and strategies that will help you turn your sensitivity into a strength, rather than a perceived weakness. When you feel stuck and frustrated and have tried many different things - making progress only to find that something happens to pull you right back to where you were, it can feel very overwhelming. It can seem as though this is only happening to you, but many people are experiencing the same thing. People find that what used to work for them no longer works in the same way. Linda shows you that you can become unstuck, no matter what your current situation is. In this program you will discover energy tips and strategies and learn from real life experiences to show you just how it’s possible to go from stuck to unstoppable by focusing on your energy. When you change yourself (your energy) your situation(s) will change – for the better. If only they would stop doing …. If only they would understand …. Why can’t they just be nice, respectful, understanding, caring, etc.? It might be someone close to you, such as a partner or spouse, a child, another family member, or a friend. Or perhaps it’s someone at work, such as your boss or a colleague. It might even be customers or employees, tradesmen or store clerks. You may be experiencing someone who is manipulative, a bully, angry, destructive, unhelpful or just plain grumpy. Money is a subject that is emotionally charged. Those who have it are afraid of losing it and those who don't are afraid of what will happen if they don't get more of it. What most people don't know is that it's the emotion (energy) that either attracts or repels money. Whether you struggle or not financially has everything to do with how you feel about money. Linda shares real life examples, tips and strategies for changing your energy around money so that you’ll feel peaceful, relaxed and confident when it comes to all aspects of money and money management. Whether you’re an introvert or you’re just very uncomfortable speaking and presenting in front of an audience, Linda shares simple and effective strategies to help you overcome the fear and become a confident and effective speaker. - Francine R., President VOICES, INC.
“Thank you for sharing your knowledge with our department. We each found it very interesting both professionally and personally. We have been talking a lot about the information you gave us and applying it to some of our more “difficult” client cases. Thank you again for sharing your knowledge and for supporting our work. “Linda, thank you for giving a very interesting presentation. I am most excited about the possibilities. I heard good comments from our members who were present. Everyone seemed to enjoy the program and to have gained from it. Again, we thank you.